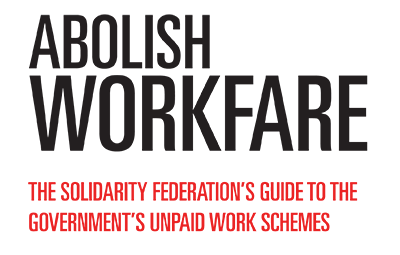 A 16-page guide to the government's unpaid labour schemes, the logic behind them, and resources for organising against them. In spite of the rhetoric workfare is not about helping people into work and workfare doesn’t create jobs. Rather we see workfare as part of a long term re-structuring of the labour market towards more temporary, lower paid jobs and with poorer conditions and fewer benefits. These ‘reforms’ come at the expense of workers’ lives but are considered necessary by those in power to support businesses. Nor can it be claimed that these schemes are about saving money, in fact workfare is hugely expensive with negligible positive outcomes. There are currently five workfare schemes, each one different and each performing a different role in this restructuring. The Work Programme and Community Action Programme seek to extend control over the daily lives of unemployed and under-employed workers; effectively turning them into state-sponsored agency staff who will fill the roles once performed by the decimated public sector. Mandatory Work Activity is about disciplining the workforce, attempting to impose an economically productive routine on those who aren’t in work. Finally, like all of the above, the Work Experience and Sector-Based Work Academies schemes are simply a subsidy of free labour to businesses disguised as socially useful endeavours. While it’s obvious that workfare is an attack on the unemployed, it’s vital to remember that this is an attack on us all. We’re moving toward a situation where many in society are living precariously, in and out of temporary low paid work, and becoming more reliant on the organs of the state to mediate their engagement with the labour market. This is partly a consequence of increasing casualisation, going hand-in-hand with the constant availability of free labour that all of the workfare schemes offer, which puts downward pressure on the wages and conditions of those of us who work. The following text details the five government workfare schemes, how they work and who benefits from them. The articles are edited from the SolFed Website (solfed.org.uk) and can be accessed in full and with references in the Workfare campaign section (bit.ly/SFworkfare). The Work Programme (WP) was introduced by the coalition government in June 2011 to replace the previous government’s Flexible New Deal, which Employment Minister Chris Grayling claimed had cost £31,284 per job (significantly more than anybody who passed through the scheme could have hoped to earn). The new programme, while similar to the previous one, was intended to save money by paying the programme’s providers ‘according to results’. What this means is that, aside from an ‘attachment fee’, Work Programme providers will only receive money from the government if the jobseeker leaves Jobseeker’s Allowance (JSA) receiving a lump sum after six months and additional monthly payments if the claimant stays off JSA for up to 18 months. Leaked documents show that one A4E suggests daily priorities for its branches should include: reviewing job centre vacancies, newspaper listing, subscribing to job alerts and, of course ‘telesales calls’ (which is to say offering their services to the businesses that are recruiting). These are essentially the same tasks assigned to jobseekers as conditions for receiving JSA. The provider’s interest in performing these task is to ‘capture’ these jobs for themselves in order to fill them from the pool of jobseekers assigned to them by the Job Centre Plus (JCP), and thereby receive a pay-off from the state for ‘helping people into work’. The Work Programme doesn’t create new jobs, it simply takes them out of the job market and channels them through providers who effectively operate as state-subsidised job agencies that have the ability to offer significant incentives to employers. The government makes no mention of the fact that every job placed through the programme is the result of a trade-off: for every person given a job through the WP, another was unable to get the job themselves. Vacancies that would have been recruited through newspapers, the jobcentre, websites or employment agencies are now being filled through WP providers. On the whole, the existence of the Work Programme means that there are fewer jobs for jobseekers to apply for and the more sucessful WP providers are, the harder it becomes to find a job and the more likely it becomes that the jobseeker will remain unemployed long enough to be assigned to the Work Programme themselves. The benefit to employers is that they get their recruitment needs met at the expense of the state. Furthemore WP providers are able to mandate work experience for their clients, and businesses also get a worker they don’t have to pay pay for a period of time, and, at the end of that period the employer is under no obligation to hire the worker. Indeed, they are perfectly entitled to go back to the Work Programme provider and ask for another person to trial for free. How receptive the companies are to these offers depends. Recently Sainsbury’s (who had been taking wage-less staff through the JCP’s ‘Work Experience’ scheme) described ‘persistent’ efforts by A4E to persuade store managers to recruit through them, in spite of repeatedly asking them to stop. The other beneficiary is, of course, the WP provider who receive a series of payments from the state. There are a number of payscales for providers depending on the age and status of the participant but to keep it simple the following is the model for a person +25yrs of age on JSA. On day one of a person being referred to the Work Programme, the provider receives £400. If the jobseeker finds work during their time on the WP and doesn’t claim JSA within the next six months the provider receives a payment of £1200. After that the provider can then make a claim every four weeks that the client remains off JSA for another year, earning them a grand total of £4,400 if he or she doesn’t claim JSA for 18 months in total. When providers start go out of business the scheme could become the remit of number of large companies; furthermore if providers continue to struggle to fulfil the targets set for them they risk having their contracts terminated. Even prime contractors like A4E, Avanta and security giant G4S are not free of risk. All the while the declining state of the labour market is likely to mean ever diminishing scope for profit-making. Chris Grayling says that Mandatory Work Activity (MWA) “is something where people have no choice but to participate, otherwise their benefits will stop until they do”. Jobseekers of any age can be mandated to take part in the MWA scheme at the discretion of a JCP advisor, even if they have been claiming JSA for only a short time. Placements are organised through private companies who arrange for the participant to work 30 hours per week for four weeks without a wage. The government claims that some jobseekers need to be taught the discipline of the labour market and this scheme was set up to provide it. It is explicitly not about providing work experience: it is a disciplinary measure and for that reason placements don’t have to be related to the person’s experience or job goals, or indeed to give them anything to put on their CV. The point is just to get them working. In spite of this stated aim, the guidance nevertheless permits people who are already in part-time or voluntary work to be referred to the scheme. At the time the policy was introduced the government admitted there was ‘little evidence’ that it would increase the likelihood of the participant finding work, and the government was forced to defend itself against charges that the policy was intended to be punitive rather than constructive. This was also the impression given to some of the potential providers of the scheme, many of whom declined to bid for contracts seeing it as a propaganda exercise and a way to sanction more claimants. The claimant, who is forced to work 30 hours a week in order to be ‘disciplined’ in the ways of labour market can’t be said to benefit. There is not even suggestion of possible employment or interviews at the end of the placement. It is the providers that are set to profit from the scheme, not to mention the businesses that receive free MWA workers. The payment model for providers is 100% payment on day one of the referral. Exactly how much the government is paying providers is unknown as, according to minister Chris Grayling details of “the payments made to mandatory work activity providers are Commercial in Confidence”. However, when inviting tenders the Government set the maximum start fee (that it would pay to providers) at £800 per referral. Does ‘society’ benefit? The government has stated that placement must provide some community benefit but that they may be at private companies. “Working towards the profit of the host organisation” counts as community benefit! So as with all types of workfare, the only beneficiaries of Mandatory Work Activity are private companies – those who organise the placements and those who employ the workers without having to pay them. Work Experience placements are organised by the JCP and are open to people aged between 16 and 24. The ‘work experience’ can last up to eight weeks, during which participants will be required to work 30 hours for JSA payments of £53.45 while continuing to look for work and attend JCP reviews. There is no expectation that the work experience will lead to a job. While the scheme is nominally voluntary there are nevertheless many reports of compulsion and lack of clarity, with people claiming they were not informed that they could refuse and that there was a ‘cooling off period’ in which they could change their mind. Originally the guidance for the scheme allowed sanctions to be used against people who withdrew after one week of agreeing to participate. There are also reports of people being mislead about whether they’d lose their benefits if they refused to take part. Furthermore, the guidance given to JCP advisers who are responsible for referring claimants to the compulsory, disciplinary Mandatory Work Activity scheme draws attention to those who have refused or withdrawn from the Work Experience scheme. And even though MWA cannot be imposed on claimants for perceived lack of experience, recent reports suggest this is used as a way of disciplining those who don’t want to take part. Any benefit to the job seeker is limited. The government says many young people lack the skills to enter the workplace, however many of the placements have seen young people stacking shelves and performing roles for which no prior experience is needed. Nor will paid staff at the companies accepting work experience benefit. There is at least one report of staff being told they’re no longer eligible for overtime as a result of the availability of work experience workers. The unemployed don’t stand to benefit either: during the Christmas peak period when shops often recruit temporary staff (or increase overtime), companies such as Argos instead stepped up to offer unpaid work experience places to the unemployed. As long as free labour is available, the need for such companies to recruit paid staff to fill vacancies is reduced. The real beneficiaries of the work experience scheme are the companies that receive a gift of free workers from the government. Work Experience, along with the other kinds of workfare go hand-in-hand with increasing causalisation and precarity in the labour market to undermine the pay and conditions of all workers. With the government’s latest Youth Contract, both the Work Experience and Sector-Based Work Academy (see below) schemes are set to be expanded. Sector-Based Work Academies (SBWA) are open to JSA and Employment and Support Allowance recipients aged over 18, and, while voluntary, claimants may lose their benefits if they withdraw after the first week. SBWA is offered in conjunction with businesses with the benefits to the employer the employer at its heart: the scheme is “designed to help meet your immediate and future recruitment needs as well as to recruit a workforce with the right skills to sustain and grow your business”. DWP boasts of placing no expense on the employers who take part in the scheme and are in receipt of what is clearly a subsidy to their businesses, having workers trained-up on their behalf while having them at their disposal as unpaid employees. Training is provided at further education colleges and private ‘training providers’ but the value of this training - which lasts at most two weeks - is debateable. One of the more high profile workfare cases involved a graduate who – in spite of already volunteering elsewhere - was mislead into believing participation in the SBWA was mandatory. They were subsequently required to stack shelves in Poundland after a week of training for the role which ‘qualified’ her with a City and Guilds qualification in Retail. Southern Railways have been creeping toward increased casualisation of their workforce and now employ agency staff on the gateline in some stations. Southern have no problem recruiting and up to now gateline jobs have come with good pay and conditions so the establishment of a government funded ‘skills academy’ with a six week ‘work experience’ element should be seen in the context of the push to reduce staff costs. Southern claim that the scheme demonstrates their commitment to helping the community: that commitment entails the DWP paying for some unemployed people do a two week BTEC module in ‘work skills’ at Croydon College before they work for 6 weeks in Southern Railways stations for no pay. The vast majority of people who have passed through the Southern ‘skills academy’ worked at the company for six weeks at the taxpayer’s expense before being dumped straight back into unemployment with nothing but a worthless certificate to show for it. As well as meaningless qualifications, Sector-Based Work Academies offer false hope to those undertaking the scheme. At the end of the scheme all that the employer is obliged to offer the participant is an interview – even if they don’t intend to recruit anybody. What’s more, the DWP’s own guidance suggests that if an employer does wish to recruit somebody at the end of their placement, by offering them an apprenticeship instead of a job the company can avoid paying minimum wage! A new compulsory work scheme for the long-term unemployed was announced by the government in November 2011. The Community Action Programme (CAP) is currently being trialled (or ‘trailblazed’, to use the government’s jargon) in four regions with the intention to implement the scheme nationally in 2013. The CAP will be organised through private companies and in many ways resembles the Work Programme but with a greater focus on community work. Participation in the scheme is mandatory and placements last six months at 30 hours a week of work with an additional 10 hours of job search under the supervision of the provider. When hearing evidence regarding the programme one member of the Social Security Advisory Committee (SSAC) pointed out that “rather than find a single sustainable job, it was more commonplace for the very long-term unemployed who were subjected to these kinds of measures to embark upon a succession of low-paid, short-term, and sometimes part-time jobs, interspersed with periods of unemployment”. The long term effects of this will to diminish the hope that eventual economic recovery will be accompanied by the return of many of public and third sector jobs as they can now be performed by wageless staff on six month placements. Guidance suggests the beneficiaries of the free labour on offer should include local authorities, government agencies, charities and social enterprises (that is to say profit-motivated private companies like the providers themselves). Furthermore, in answers to questions a representative from the Department for Work and Pensions (DWP) said that it was likely that the scheme would include ‘retail placements’ which suggests that the definition of what the government considers to be a community benefit includes for-profit high street businesses. Once again the providers themselves are set to be the major beneficiaries of the programme. The present guidance closely resembles that of the Work Programme. The final pay schemes won’t be clear until the CAP is rolled out nationally later in the year and if Mandatory Work Activity is any indication the precise fees may remain confidential. But is likely to cost millions, regardless of results. • Reputational damage. Many high street firms spend millions on their brand images. The negative publicity around workfare has already caused numerous firms to pull out. Pickets, protests, occupations and so on all help in this regard. • Economic damage. Pickets can turn shoppers away, or flash mobs can force stores to close. This all costs firms money, and when head office gets calls from store managers across the country, workfare doesn’t look such an attractive option. • Communications blockades. Many modern businesses are highly dependent on telecommunications to function. Bombarding select phone numbers or emails with complaints about workfare can force the issue and therefore add to the cost of using workfare labour. Produced by the Unwaged Workers Network of the Solidarity Federation. The Solidarity Federation is a revolutionary union initiative: a way for working class people to organise and fight for a better world. Anything that hits them in the pocket and therefore makes the costs of workfare go up makes it more likely they’ll pull out, and ultimately for the schemes to collapse. Such direct action can take many forms.